In three phases: early, normal and slightly late. Crisio comes out of different stages and moments. This quality division into phases allows, with patience and anticipation, to create a harmonious and unique wine, which goes back to its origins thanks to a process of separation for a perfect result. It is a great “Verdicchio Riserva”, very long-lived, which can be uncorked even after eight to ten year of life. Crisio is produced in the vineyards of Serra de’ Conti area, next to CasalFarneto Wine Estate, on a soil of medium consistency tending to sandy with southwest exposure. A peculiar feature is that harvesting occurs in three different moments in the same year. Fermentation of the first harvest is in small barrels and the following two in steel tanks. Refinement phase lasts over one year in steel tanks, and for at least one more year in bottle. Perfume: A sturdy aromatic note of freshness and persistent smell of citrus, white flowers, white fruit and aromatic herbs. Flavour: Full-bodied, complex, elegant, fresh, mineral, very flavoursome with a pleasant acidic hint and a persistent aftertaste of almond, typical of Verdicchio wines. It pairs beautifully with any seafood main dish, like shellfish or sushi, but it’s also perfect with first courses garnished with aromatic herbs, mushrooms, truffles or semi-mature cheeses. This kind of harvest usually happens at the beginning of September, with the aim of producing wines whose main qualities are great freshness and optimum acidity. It is the traditional harvest, taking place in the months of September and October, allowing a harvesting with the right balance of sugar and acids in the wine produced. 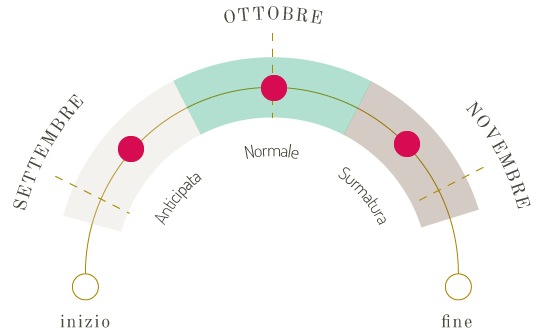 In this case, to obtain highly structured wines, harvesting takes place in the second half of October, when the clusters have reached a very high ripening stage. Wines coming from this type of late harvest will certainly be full-bodied and enhanced in their softness and structure.